Bathurst Main. Brick, Water, Coal and Clay. The Colliery. SK 46/56 47306960. The Brickyard. SK 46/56 461693. 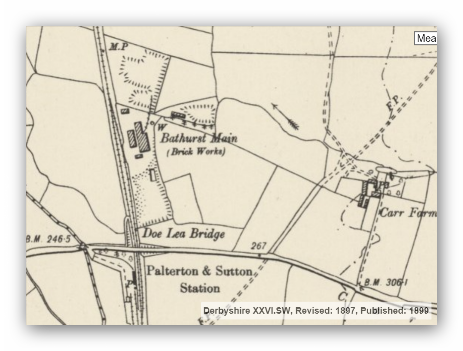 During the late nineteenth century a colliery was situated to the south of the later Lancashire, Derbyshire and East Coast Railway (Bolsover) tunnel between Carr Vale and Scarcliffe, on Darwood Lane, Spittal Green, on the slope between Carr Vale and Bolsover. Bathurst Main colliery mined coal on land belonging to Earl Bathurst or Lord Byron of Cirencester Park Gloucestershire who purchased the manors of Palterton and Scarcliffe in the middle of the eighteenth century from the Aspley family. It was on this original site that the clays were mined from a small footril. The colliery worked from two small seams of coal, the Wales and Highmain seams. Sometimes called the Upper Silkstone or Silkstone seams. The colliery worked small scale here until around 1891 (According to. Geology of the Country Around Chesterfield, Matlock and Mansfield. Smith, Rhys and Eden. H.M.S.O.) when work from the early adits and the later shaft ceased officially. Unofficially however the colliery 'worked' during the miners strikes of the twentieth century culminating in production during the 1972 strike when coal was wound to the surface using an overturned motor-cycle as a winding engine. You can appreciate the small scale of the coal mining operations when you realise that the Highmain seam is only twenty three inches thick and the Wales seam between eleven and sixteen inches thick as they run from Carr Vale to Palterton. It was Earl Bathurst along with other local land owners who sought to exploit mineral reserves on their estates but I think they may have been a little disappointed with the coal reserves here. The colliery was working in 1880 owned by the company of Minnikin & Co. It was on this original site that the clays were mined from the small footril. According to later reports the colliery was in use as late as 1896 when the brickworks were to be sold at auction as a going concern. This raises the question were there two collieries in the vicinity? 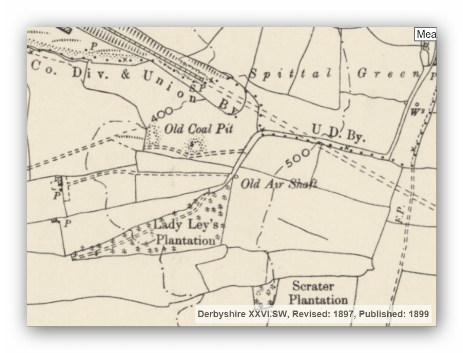 Were the two adits a later colliery and the single shaft an earlier colliery? The single shaft method of mining was outlawed in 1862 after the Hartley colliery disaster. (See below). Or could it be that both adits and the shaft formed one mine? A lease was taken out for the mine in 1885 (31/12/1885) from Lord Byron for forty years at a cost of £100 this included the Clowne seam which lays at a depth of 497 feet from the surface and is around three feet nine inches thick and another seam which is eleven yards above it. (This second seam is only seven inches thick as the Swinton Pottery Coal). Not really a viable proposition one would think. The lease provided for 257 acres of coal. 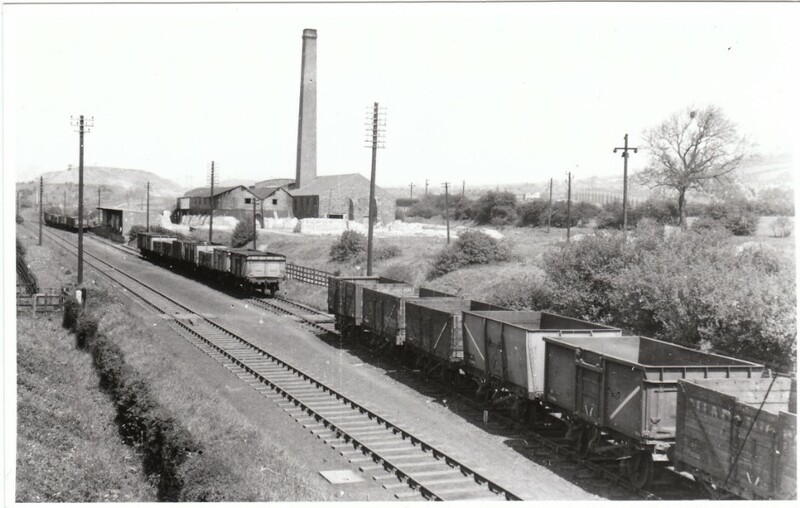 The mined coal was transported from the colliery to the brick works by fifty chains of haulage rope powered by a 14 horsepower horizontal haulage engine. Near to the colliery site a borehole was drilled one hundred and forty feet into the measures below the Highmain coal seam and a water treatment plant was set up for Bolsover Council as the borehole yielded between four and eight thousand gallons of water per hour. The water was used to augment the supply from the tunnel, then treated with lime and pumped up to Bolsover to supply the area. A lease was taken out for the mine in 1885 (31/12/1885) from Lord Byron for forty years at a cost of £100 this included the Clowne seam which lays at a depth of 497 feet from the surface and is around three feet nine inches thick and another seam which is eleven yards above it. (This second seam is only seven inches thick as the Swinton Pottery Coal). Not really a viable proposition one would think. The lease provided for 257 acres of coal. The mined coal and clay was transported from the colliery to the brick works by fifty chains of haulage rope powered by a 14 horsepower horizontal haulage engine. Compiled by A.H. Stokes, H.M. Inspector of Mines. Derby. 28th January 1893. Mineral: Silkstone Coal & Fireclay. Date of Abandonment: 15th December 1891. Cause of Abandonment: Thickness of seam. Coal: 23 inches.Section: Clay: 30 inches. 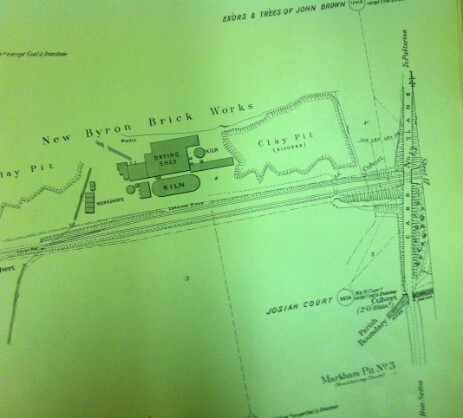 The Byron brickworks or Bathurst Main brickworks was started in the late eighteenth century by private enterprise working coal and clay on a lease from Earl Bathurst or Lord Byron of Cirencester Park Gloucestershire. However something of note is the lane leading towards the area: The road runs from the castle and down what is now Castle Lane, it appears to turn off towards where New Bolsover will later be built, it carries on down towards Water Lane branching off and going down what will later be Charlesworth Street. The main part of the road stops at the brook on Water Lane. The road is named as Cobster Lane. 3). Cob (Kob) is; building material of clay and straw. Therefore Cobster is possibly a person who makes bricks from local clay. 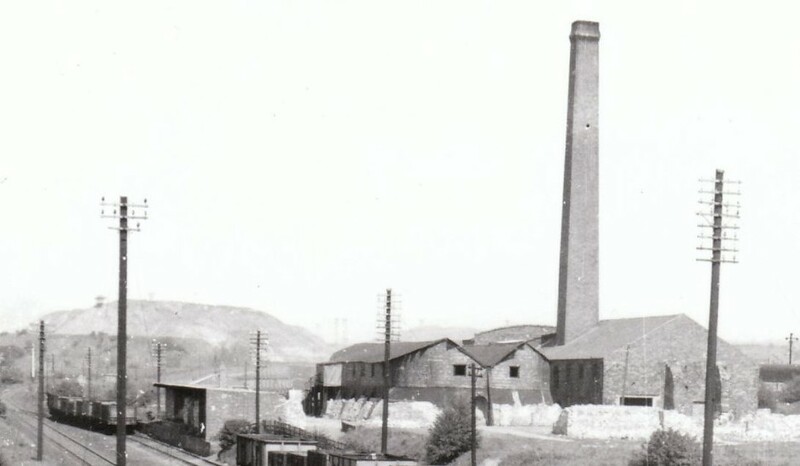 Electricity generated at the Staveley companies Devonshire Works and was fed to the New Byron Brick company works during 1927 as part of a fifty four point two mile system supplying local industry with power on a six thousand six hundred volt supply at thirty cycles per second. By the 1890's it would appear that a better and larger supply of clay was to be found near to the river Doe Lea and was extracted from clay holes, a type of opencast mining, by boring and firing of explosives. The clay thus extracted would be ground and mixed with water. The clay would then be pressed and formed into moulds, dried and then fired in ovens. Several types of bricks were manufactured from the clays of the mudstones, silty mudstones and siltstones which were found above the Wales coal seam. The workings included twenty foot of silty mudstones and siltstone bands overlaying twenty five foot of mudstone and silty mudstone with ironstone bands and nodules. The works closed before the Second World War but re-opened during the war to supply the nations building needs. The clay holes were later filled in with refuse and the site landscaped. It is said that Byron Bricks were the countries hardest and most colliery companies purchased their bricks from here to use at their collieries, these bricks were marked with the name of the particular colliery or firm they were to be used at and so several variations of the same brick can be unearthed locally. Hand made brick production prior to mechanisation. Each brick was made from a mixture of clay and water which was made to a workable consistency unless the clay was naturally wet enough when it would be used straight from the clay pit.The brickmaker would then cut a brick sized block of clay which he would manipulate on a solid workbench this would then be rolled in sand to stop the bricks sticking together prior to and during the firing process, the block of clay was then worked into a single brick shaped hollow wooden mould which was then trimmed with either a metal or wooden tool. The plastic brick would then be removed from the mould and stacked to dry a little. This process was repeated several times until the required number of bricks were available to fill the kiln. A simple square kiln called a clamp was then constructed nearby from old bricks and the new unfired plastic bricks were laid inside with coal slack in between the gaps in the layers of bricks. Coal slack or dust was a usually an unwanted by-product of mining as the policy of coal mining was the ‘bigger the better’. The clamp was then enclosed other than at the mouth and at a chimney so the furnace could be fed with coal and air and the waste smoke and gases could be allowed to escape, the old brick walls were finally lined with clay to prevent air coming in other than through the mouth. The clamp was then lit and fed with coal until the brick maker, through experience felt the bricks were sufficiently fired to be allowed to cool down. Upon cooling the clamp was broken up revealing the new bricks which were removed for use or sale. The bricks were lightly knocked together and if they ‘chinked’ they were good, if they ‘thudded’ or broke up they were no good. A decent brick maker should have at least an eighty percent success rate on each firing. Until the large brick making ovens came into existence to produce bricks by the millions on a never ending process this is how a few thousand bricks at a time were made. A new clamp was constructed each time. New Byron Brick Company Palterton. Bathurst Main Brick and Tile Company. In the 1890's it would appear that a large supply of clay was to be found near to the river Doe Lea in Palterton this clay was extracted from deep excavations known as clay holes, a type of opencast mining, by boring and firing of explosives. The clay thus extracted would be ground and mixed with water. The clay would then be pressed and formed into moulds, dried and then fired in ovens. 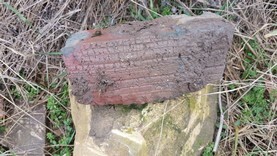 Several types of bricks were manufactured from the clays of the mudstones, silty mudstones and siltstones which were found above the Wales coal seam. The workings included twenty foot of silty mudstones and siltstone bands overlaying twenty five foot of mudstone and silty mudstone with ironstone bands and nodules. A good supply of water for washing and mixing with the clay, a coal mine for coal to burn to heat and dry the clay and the local railway to transport the bricks away from the site were all nearby. After the death of the owner a Charles Baker in 1890 the Bathurst Firestone and Brick Company, held under lease from Earl Bathurst and his Trustees under a lease taken out on the 31st. December 1895 for forty years at £100 per annum rent, since reduced to £50 was put up for auction. The Auction was held at the Angel Hotel Chesterfield on Saturday April 5th. 1890 the works were sold as a going concern and included a mine. In 1893 the works were again put up for auction again by Messrs. Byron and Rangley on, October 28th 1893 at 3:00 pm. Again at the Angel Hotel Chesterfield. Property includes a Newcastle kiln with production capabilities of 100,000 bricks per week with a new chimney. Two Galloway boilers and a well for water for the works which was thirty feet deep. An engine house, drying shed, tramway to footril and winding engine. Along with other portable plant. The works is capable of producing 120,000 bricks per week in total. The works is connected to the Doe Lea Branch line of the Midland Railway by sidings and access is made by a good road. Once again the works is put up for auction as a going concern and is again to be sold by auction at the Angel Hotel Chesterfield on February 1st. 1896. By agreement with Pearson and Sons contractors which runs out at the end of June next. Property includes kilns, drying sheds, two eight foot clay pans and fifteen inch rollers, pug mill, brick press, stone crusher, two Galloway boilers, two cottages and the works. The supply of clay is almost unlimited and is thick and of excellent quality. There is a high demand for bricks locally for workers cottages works and underground use with the extensive coal field building programmes at Bolsover, Creswell, Shirebrook and Warsop. It would appear then that during this period of short ownership a lot of investment was being made to the works culminating in the sale of the plant during the building boom of the local colliery and housing sites at Bolsover, Creswell, Shirebrook and Warsop for the Bolsover, Sheepbridge , Shirebrook and Staveley companies. After the fire the building is inspected by Mr. Platts. Mr. Chapman and Mr. Vass. (Date circa. 1935). New Byron Brick Company and Tile Makers. Herbert Leslie Vass, Manager. 1930's. · From the Derbyshire Times. Saturday July the 20th 1889 p. 8: col 5. · A Child Decapitated Near Bolsover. · A Colliery Proprietor Censured. 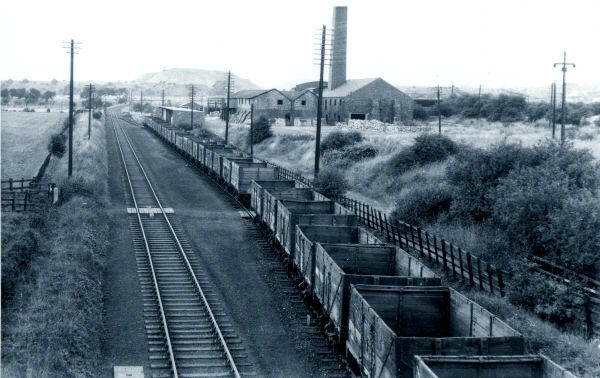 On Friday, the 12th instant an inquest was opened at Mr Baker's brickworks near Bolsover Mr C. G. Busby coroner respecting the death of Mary Tinsley aged two the was killed by three trolleys passing over her on the tramway at the Bathurst Main colliery Bolsover. The inquest was however adjourned until Monday when it was held in at the Anchor Inn at Bolsover. George Thomas Tinsley, Market Gardner identified the body is that of his daughter. The child had gone to stay at Mrs Redferns Bathurst Cottage. The trolley line ran past the house down to the brick yard and it was opposite the cottage where his daughter was killed. There was no fencing to keep people of the line. Mary Ann Radford and said about two o'clock the deceased went out of the house towards the tram line, her own child following her. A few minutes afterwards she heard the trolleys ascending and she ran and found the deceased body lying on the line decapitated. It was about 30 to 40 yards away from the house. The head was completely severed from the trunk. She at once obtained assistance, and had the body removed into the house. There was no fence on either side of the line. She had never complained of the dangerous state of the line. She had never heard anyone speak about a fence being put all to prevent people from getting onto the line. 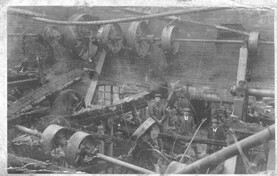 George Bynot, engine driver at the colliery, said he drove the engine that lowered the wagons from the colliery to the brick yard. The engine was a stationary one, and was situated at the bottom of the incline. When in the engine shed he could not see the line but had a man who gave him signals when the line was clear. On the day named about 3 p.m. the signal to proceed was given. He never heard any jerk as the wagons came down. When near the cottages he always slackened speed. Three wagons when full, weigh about three and half tons. He had never had an accident there previously. He had never had any complaint with reference to a fence being placed on each side of the line. Henry Smith, Palterton, said he was signal man at the colliery incline. He started the wagons by pushing them off and they follow them down as far as the cottages about 900 yards away the wagons always stop there, in order that he might see whether the line was clear or not. If it was he waved his hands to the engine driver, who came to the window in the shed. On the day named at three o'clock he did not see the deceased on the line He could see the part of the line where the deceased was killed. Thomas Redfern, brick maker said the place where the deceased lost her life was a very dangerous one, but he had never received any complaints about it. It was a very dangerous place for children. He could not keep his own children off. He then spoke to finding the body on the line. Captain Smith, said Mr A. H. Stokes had seen the place, but he did not complained to them about it. A verdict of accidental death was returned, the jury adding the following rider; that they consider Mr Baker the owner of the tramway censurable for not having erected a sufficient fencing at the side of the said tramway, and recommended that such fence be forthwith erected and further that some better system be established with the engine house on the top of the said tramway so that the wagons descending the tramway might be brought direct to a standstill. 1891 Census for Bathurst Brick Yard. Scarcliffe Parish. RG12/2649 Schedule 223. NAME. RELATIONSHIP. AGE. OCCUPATION. BIRTH PLACE. 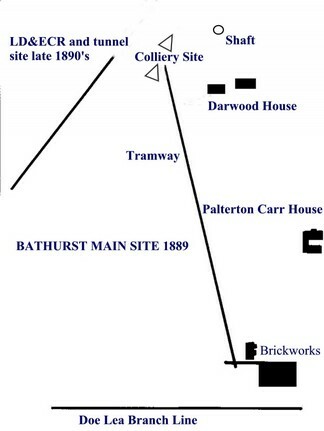 1891 Census for Bathurst Brick Yard. Scarcliffe Parish. RG12/2649 Schedule 224. A study of the brickwork inside Darwood House are hand made and are therefore earlier than 1840 in origin. Either this building is older than 1840 or has been built using older bricks from the colliery or other such local building. The Lancashire, Derbyshire & East Coast Railway which helped the village of Carr Vale grow was planned as early as 1891 and it may have eventually been the death blow to the colliery overlooking the village as when the railway was surveyed the colliery was working an area that could possibly have conflicted with the tunnel operations. Whilst the tunnel was being driven a building was used, made from local bricks to store the powder and fuse for the railway navvies, the outbuildings having iron plated doors to store the powder and a reinforced concrete and brick safe was constructed to house the fuses inside the main building. Many of the bricks used to build the house were of early design and hand made this would suggest that the building was constructed using materials from an earlier building. The building was later used as a farm but is now derelict. 'Boggard House' or Darwood farm. Nearby ran an endless rope haulage system used to haul in materials from the clay pits on the hillside to the new brickworks at the side of the Doe Lea branch line and was also said to have run to the tunnel construction site. The tunnel and later the village of Carr Vale were built out of locally made bricks. Bricks as a building material had been used since Biblical times, it was however a labour intensive operation often performed by slave labour, costly and time consuming. Natural stone was in great supply and quarried locally it could be dressed and made fairly uniform in shape but was heavy and cumbersome to transport and use. The stone being quarried from the sandstone, limestone and grit stone bassets which form part of the geology of the area. Brick had two things going in its favour; firstly the abundant supply of clays available and secondly and simply the fact that bricks could be held in the hand of one person. A novel form of taxation was once levied on bricks which led to the formation of a brick which was twice the standard size. Twice the size but half the tax. Bricks were originally all hand made and as such were not always uniform in shape although the wooden mould used to shape them was. Brick is documented throughout the building of many local stately homes and houses, and were used in fairly large numbers in the building of Bolsover Castle and the Halls of Sutton and Hardwick. Stone was the main building material but brick was the status symbol of the era. When Richard Arkwright (Senior, later to become Sir), built the works and workers cottages at Cromford near Matlock he incorporated brickwork into the buildings as a show of his artistic flair and prosperity. As coal was one of the main industries in the area and clay formed part of the underlying strata associated with the geology of the coal seams, it was inevitable that the two would go hand in hand. Potteries and brick working grew up with the coal mining enterprises, with the shaft and tunnel support in areas of permanent use being brick lined. i.e.. The pit bottom and major main air passages underground. All the areas around the Derbyshire coalfield exploited the easily accessible clay reserves to fabricate bricks for the numerous small collieries which sprang up from the late eighteenth century onwards. Collieries at Brampton, Old Brampton and Holymoorside were no exception. Rod Knoll mine at Old Brampton mined some small coal seams but specialised in the extraction of fire clay. At Slatepitdale mine east of Stone Edge Plantation, Holymoorside, which was abandoned in 1895. Had within its boundaries the Stone Edge Clay Pit (abandoned 1927). And the Sitwell Clay Pit (abandoned 1926). Another important mineral mined in the area was Ganister, which is a siliceous rock (high silica content) which when mixed with clay gave materials produced from it fireproof qualities which could be used as fire brick linings for furnaces and kilns. One such mine which extracted the ganister was the Nab Wood Ganister mine found at Walton. Calow Colliery had a brickworks on Church Lane, many old bricks make up the access road on the site of the old works. The Allpits Collieries had clay pits and works on Blacksmiths Lane, a pond and arable field are all that is left of the site. 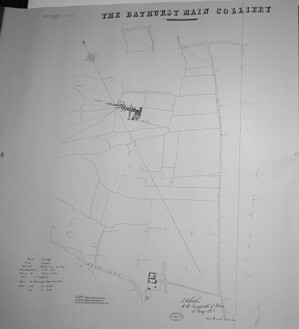 The Adelphi mines of the Smith family on Duckmanton moor had clay pits and brick kilns according to the Ordnance Survey maps. The collieries at Storforth Lane Birdholme, were served with a brickworks at the side of the railway line from Clay Cross to Chesterfield. 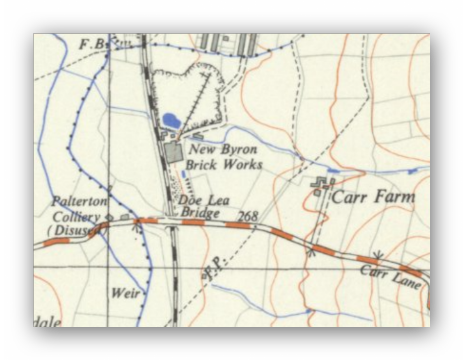 A brickworks existed on Pottery Lane, Whittington Moor, near to Pearsons Pottery. The company extracting clay from its coal mines at Barlow, Cutthorpe, Dunston, Newbold and the Whittington area. With brickworks nearby at Dunston. Also in the area was Tapton Lock brickworks which served the collieries at Stonegravels and Lockoford Lane and along the Chesterfield canal. Brockwell brickyard near to Chesterfield served the Newbold collieries Later the larger collieries at Grassmoor, Bonds Main, Bolsover and Pilsley produced bricks by mechanisation on the colliery site. The list is endless. The movement towards mechanising the brick production process was a slow one which went on steadily throughout the Industrial Revolution. One useful invention which came during the middle of the eighteenth century was the machine which was capable of compacting the clay under rollers, but the bricks were still hand made in wooden moulds. Most of the labour saving inventions came along later in the nineteenth century. One such machine which came into production in the early part of the nineteenth century and was able to mass produce a uniformed shape of brick which could produce bricks cheaply and efficiently. This 'Plastic Brick' machine as produced by companies like Messrs. Batley of Parkgate Foundry Rotherham and installed at Pilsley colliery revolutionised brick making and was capable of producing some 35,000 bricks each week for use at the colliery. Incidentally up until the early 1980's most local collieries employed a team of bricklayers to work underground. Every colliery needed thousands of bricks for roadway support and shaft lining and because of the movement towards larger collieries and larger workforces housing for colliery workers was embarked upon. Most of the newer collieries of the late nineteenth and early twentieth centuries built colliery housing using their own made bricks. The Bolsover colliery company building the 'Model Village' project at New Bolsover using bricks made at Bolsover colliery and the Byron or Bathurst Main brickworks producing further materials for the building of Carr Vale an overspill for local industrial workers dwellings. The Barlow collieries built a row of terraced houses (Rutland Terrace) in the late nineteenth century to house its workforce. The Barrow Hill, Speedwell, Calow Green, Bole Hill, Arkwright and Poolsbrook villages were set up along with many others to house the Staveley company workforce. The local railway companies purchased millions of locally made bricks for housing and bridge building projects, many of these were the waterproof blue-glazed engineering bricks which were put to use supporting enbankments and bridges and then capped off with a dressed stone block. The brick making clay was extracted from surface clay holes, a type of opencast mining, by boring and firing of explosives. The clay thus extracted would be ground and mixed with water. The clay would then be pressed and formed into moulds, dried and then fired in ovens. Several types of bricks were manufactured from the clays of the mudstones, silty mudstones and siltstones which were found above the coal seams. The finished bricks would then be stacked or loaded into railway waggons ready for transporting. Freddie Wagstaff's Cabin. John Platts. 1889 Schematic. A reject brick. Colliery Abandonment Plan 1893. 1898 Plan. Midland Line & Brickyard. Clay Holes Looking Towards Bolsover Colliery. Play Time. Clay Holes Looking Towards Carr vale. ( All Three by John Platts). Fused and Rejected Bricks. Railway Bill. Glynn Waite. Good Bricks. 1960's View from an small photograph. Darwood House. *After the fire. *(The building is inspected by Mr. Platts. Mr. Chapman and Mr. Vass. (Date circa. 1935)). Maps from the National Library of Scotland. (Opens in a new window). Bathurst Brickyard 2 chains plan. Glynn Waite. 1899 Brick yard, Colliery site.